Mudcrab Chitin is dropped by mudcrabs. 14% chance of 1-3 samples being carried by any Silver Hand member. All types of apothecary's satchels as well as Pots hanging from cooking splits have a 3% chance of containing one. 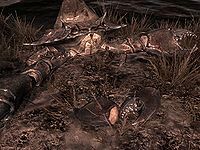 All mudcrabs, including the Mudcrab Guardian Spirit, will drop one or two samples of mudcrab chitin, depending on their size. This page was last modified on 9 April 2018, at 05:43.